A multi-generational family business, Larsen Marine provides boater sales, service and storage in a massive marina in Waukegan, IL on the western shore of Lake Michigan. Graphic designer Paul Uhl sought to create a state-of-the-art interactive and informative web presence for the business’s new web site. With years in the print publishing business, Paul created a highly detailed set of flat designs in Adobe Photoshop and InDesign that needed to be translated, pixel-perfect, to a new CMS framework. With our years of experience in working with print designers designing for the web, we translated Paul’s designs into a highly customized Joomla! install, preserving all original design specifications, leaving nothing to “That’s good enough.” The site holds within it a custom billing system, allowing customers to pay storage and repair invoices online. With the new Joomla! 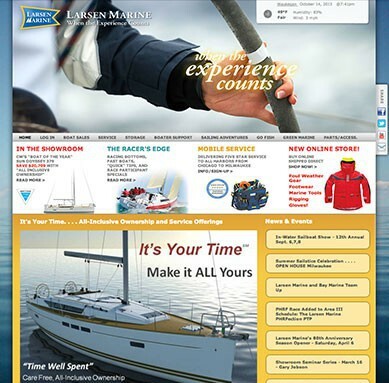 site, Larsen Marine’s Marketing Department has been able to update and customize content directly targeted to their seasonal sales goals and customer outreach efforts. Alan Kimrey also shot a good portion of the Larsen-specific photography on the new site. Cage Memorial is a long-standing cornerstone of Chicago’s South Shore community. Independent funeral homes are constantly approached by internet services providing generic, canned web solutions “tailored” for the industry with little opportunity for individuality or ultimate control over the content. Called in following our work with Brady-Gill Funeral Home and Cremation Services, we worked with Cage staff to create a sleek Joomla! 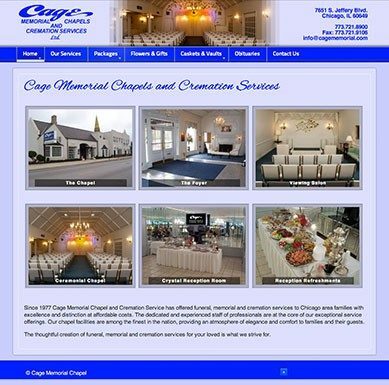 adaptation of their existing web branding, installing our custom Obituary and Guest Book platform, both of which are controlled directly by Cage personnel without ongoing subscription fees. Cage Memorial also wanted to manage Flower and Gift sales directly. We built out the Joomla! installed shopping cart with external payment processing through their own bank while avoiding the need for potentially costly PCI compliance. Shopping cart and the broader web site are both managed within the same Joomla! framework. Alan Kimrey also provided supplemental interior photography for the site.